Until the First World War the large village of Potutory, which lies southeast of Berezhany (now Ternopil oblast), and the low mountain of Lysonia (only 399 meters above sea level), was little known to anyone besides the residents of the Berezhany area. In 1916 it became a symbol of heroism and valor. Lysonia is linked to one of the biggest battles on the territory of Galicia, in which the Legion of the Ukrainian Sich Riflemen (Ukrainski Sichovi Striltsi) took part. Someone may ask: what kind of heroic feat could 1,500 soldiers accomplish at a time when the Russian imperial army was organizing a large-scale attack on the positions of the Habsburg state’s Southern Army? But is it not heroism when 1,500 courageous men manage to save the Austrian emperor’s entire army from being utterly routed but Turkish formations as well? We turn to August 1916, eastern Galicia. The Austrian-Hungarian army, under pressure from the Russian army, retreated westward. The Habsburg Empire was only beginning to recover from the Russians’ June attack, the so-called Brusilov Offensive, which allowed the Russian army to advance 200 km. deep into the front area. On Aug. 14-15 the Russian army inflicted a crushing defeat on the 35th Rifle Regiment of the Sich Riflemen as well as two companies. The Austrian military headquarters then decided to divide the Ukrainian Sich Riflemen Regiment into two separate battalions. On Aug. 16 the second battalion was based on a reserve in Posukhiv. By the end of the month it had merged with the first battalion and moved toward Lysonia. The Sich Riflemen, commanded by Antin Varyvoda, who had replaced Zenon Kossak, were supposed to act in coordination with the units of the 55th Division of the Southern Army. On Sept. 2 Russian army units managed to take the positions of the 35th Riflemen Regiment. Russians would have captured the hill if not for the help of the 1st, 2nd, 3rd, and 4th companies of the 1st Battalion of the USS and the 310th Hungarian Regiment. During the massed counterattack on the evening of Sept. 4 the Austro-Hungarian forces managed to win back their positions. Vasyl Dzikovsky, who at one time had worked in the Central Administration of the Ukrainian Sich Riflemen, describes all these horrific events in his book Battles near Potutory. These battles cost the Sich Riflemen dearly: 81 soldiers were killed, 293 were injured, and another 285 were taken prisoner by the Russians, who interned them in a camp for prisoners of war in Tsaritsyn. Within a few days, after the ranks of the USS were slightly expanded, the battalions were transferred to positions in the eastern outskirts of Potutory. On Sept. 29 the Russian army started an offensive on Berezhany. On Sept. 30 artillery fire destroyed the units of the 129th Brigade on Lysonia. After a short storming of the mountain, the Russians captured the positions of the 308th Hungarian Regiment. The front between Lysonia and Potutory fell. 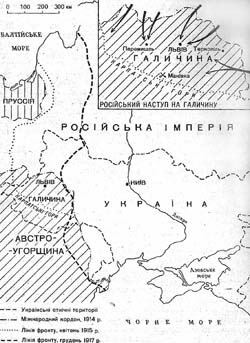 The Russian army then launched an offensive on Posukhiv along the valley of the Zolota Lypa River. Here they were detained by units of the Ukrainian Sich Riflemen. But with their numerically superior troops and weapons, the Russians started to encircle the USS on three sides, intending to trap them completely. A cul-de-sac was created. The headquarters of the Austrian army could not provide the Sich Riflemen with assistance because the Austrian forces were retreating. Only a handful of people, including Trukh’s unit, managed to escape from the encirclement near Potutory. The rest were doomed. However, the Russian army did not destroy the USS physically, but took them prisoner. The Sich Riflemen were brought as prisoners of war to a camp in Tsaritsyno, which they left only in 1917-18. Many of them joined the ranks of the Ukrainian National Republic (UNR) army and the Ukrainian Galician Army (UHA). Thanks to the Riflemen’s valor, the Russians did not succeed in utterly destroying Austria’s army in October 1916. But it was a costly triumph for the Ukrainians: the regiment lost nearly 700 soldiers; in early September there had been 47 officers and 1,685 soldiers. Such Ukrainian commanders as Battalion Commander Goruk, Captains Melnyk and Sushko - future leading figures of the Ukrainian Military Organization (UVO) and the Organization of Ukrainian Nationalists (OUN) - and officers Chernyk and Kuchabsky helped write those fearful and heroic pages of Ukrainian history. The commander of the 1st Battalion of the USS, Omelian Lysniak, one of the most prominent Ukrainian military leaders of the 20th century, achieved eternal glory on the battlefield. After the battles on Lysonia and Potutory he was taken prisoner by the Russians; he returned to Galicia in 1918, where he immediately set about forming the Ukrainian Galician Army. In 1919 he became the commander of the Zolochiv military district, and was later appointed the commander of the 3rd Brigade of the UHA. He took part in the Polish-Ukrainian hostilities and afterwards waged battles against the Bolsheviks and the Whites together with UNR army units. He immigrated to Czechoslovakia in 1921 and later to Austria. He was then captured by the NKVD and brought back to the USSR. His further destiny is unknown, although it is highly unlikely that he could have survived the NKVD and GULAG torture chambers. However, there is unverified evidence that he returned to Vienna after his imprisonment and exile. Ukrainians began learning the truth about the exploits of the Sich Riflemen only in the late 1980s. The grateful residents of Berezhany, with the assistance of other patriotic Ukrainian citizens, erected a Cross of Grief and Glory on Lysonia in memory of the fallen Riflemen. In 1991 young Ukrainian patriots from the Plast scouting organization organized a summer camp called “Lysonia” there. Ivan Mykhailovych Havdyda was the main founder of the camp; soon he became the “father” of the nationwide civic organization of the Young Nationalists Congress (MNK). Since 1998 “Lysonia” is recognized as the organizational camp of the MNK, where hundreds of young patriots from all over Ukraine congregate every summer. Havdyda died under mysterious circumstances in August 2003. In 2004, in keeping with a decision passed by the Central Leadership of the MNK, the “Lysonia” camp was named in his honor. “Lysonia” is a stationary camp. It lasts for nearly 10 days and is noted for its event-packed program and strict discipline. Participants are immediately sent home for such violations as drinking alcohol. There is also a kind of “penal battalion,” where those who violate camp regulations have a chance to correct their “faults.” Violators of camp discipline do corrective work, mainly cleaning up the camp territory, preparing fuel, etc. There is an interesting program for model campers. It includes a 30- to 40-kilometer hike, an obstacle course, boxing, soccer, and rugby competitions, training in Cossack-style martial arts, and many other events. A theoretical part consisting of thematic lectures is also featured in the program. One of the most interesting lectures is about the battles on Lysonia. Today “Lysonia” is one of the oldest and largest youth camps in Ukraine.